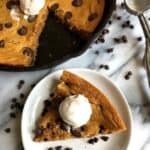 Peanut Butter Cookie Skillet that is gluten free, made with natural sweetener, no butter, and comes together in less than thirty minutes. Your healthy dessert just got an upgrade. In a large bowl, whisk egg. Beat in peanut butter, coconut oil, maple syrup, and vanilla until smooth. In a small bowl, stir together almond flour, baking soda, and salt. Add dry ingredients to wet and stir till combined. You can double the recipe if you want a thicker skillet!! Cooking time will be longer.